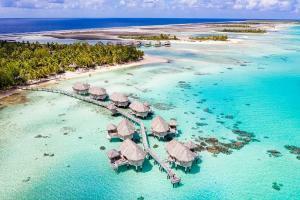 This Polynesian-style resort offers 37 very spacious beach bungalows, overwater bungalows and suites with access to isolated pink sand beaches and a lagoon teeming with tropical marine life. Bungalows are constructed with natural wood and offer ceiling fan, mini bar, coffee/tea maker, direct dial phone, safe, television and private verandah. The bar and restaurant located poolside with views of the lagoon. Located on secluded white sandy beach on the Tikehau Island. Can only be reached by private boat from Airport and the main village. The Poreho Restaurant and terrace open onto the lagoon offering a sumptuous setting for a taste of European and Polynesian cuisine. The Tianoa Bar, nestled between the white sand beach, the freshwater pool and the lagoon, offers a indispensable romantic background. Sunset Cruises, Scuba Diving, Fishing.